It's time that we go for shopping ! 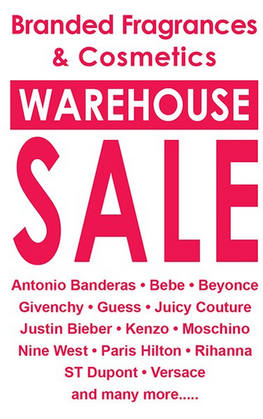 Because there is a warehouse sale for branded fragrance and cosmetic in town! Are you excited like me ? Can you imagine that you can save up to 70% and get ready for christmas present , birthday present or any anniversary present. Shopping tips: If you want to get hot item product be sure to be there on the first day of sale, they might run out very fast. And do come also for the last day, I think they will give even greater deal for closing. Wear comfortably, and get ready your nose to sniff sniff..
And best that you make a list before you go, so you have a clear list and no one left out from your list. Why pay full price when you can get discounted one ?